Florida gained an exemplary tennis volunteer when Helen Moser Petersen relocated from Indiana to Bradenton. There she picked up her almost life-long work in youth guidance and tennis via education, and bringing her inspirational book series to the Sunshine State. Through original funding from the Hamilton County Community Tennis Association (HCCTA) in Indiana and the national USTA Foundation, she created a reading program called Champion Reads, consisting of seven chapter biographies of athletes who overcame challenges to champions and subsequently devoted their lives to helping others: Arthur Ashe, James Blake, Jean Driscoll, Billie Jean King, Sam McNew, Gale Sayers, and George Taliaferro. The books also include 36-page teacher guides which cover various school subject areas. More than 31,000 of the books have been read by all ages all over the country. When she realized there was a generation of coaches and players who were unfamiliar with Ashe as a humanitarian who broke racial barriers, worked to end segregation across the globe, founded the National Junior Tennis and Learning network (NJTL), and until the end of his life was active in civil rights. She set to work on educating new generations about Arthur Ashe. She worked with the HCCTA to buy $1,000 worth of copies of Ashe’s memoir, Days of Grace, which he had finished writing less than a week before his death. She gave copies to high schools and libraries around Hamilton County, located just north of Indianapolis. Now Petersen has brought her reading program to Florida and the Bradenton/Sarasota area. 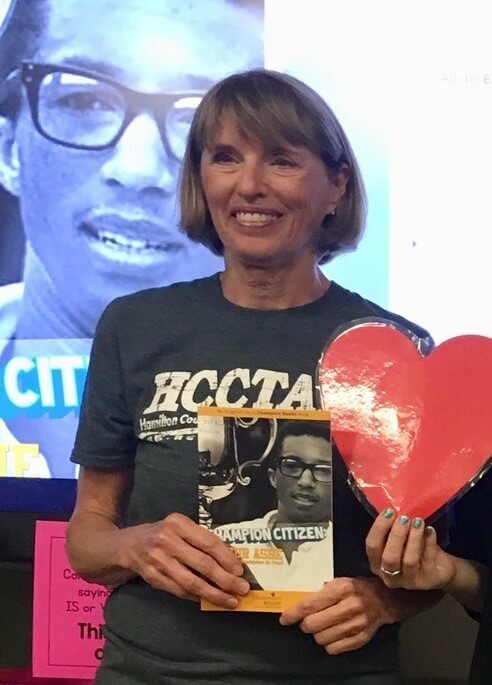 Last month she read Champion Citizen: Arthur Ashe to all 125 third graders at Laurel Nokomis School in Sarasota to help celebrate Black History Month. All the children received gift bags with books provided by anonymous donors, assembled by local USTA League players. She says the creation of the seven books in the series was made possible by grants from the USTA Foundation, which last year during the US Open had 125 copies of her book on Ashe in the USTA President’s Suite. This was during the 2018 Arthur Ashe Kids Day to commemorate Ashe’s 50 anniversary of winning the US Open men’s singles title. In addition to book stores, the books are sold on Amazon.com, Barnes & Noble’s website, as audio books on Apple’s iTunes, and just about every other outlet. A tennis volunteer and USTA tennis player for 43 years, Petersen says she looks forward to bringing Ashe’s message, and the messages of other champions who overcame adversity, to Southwest Florida. and thanks her for educating and changing the lives of young people in the Bradenton/Sarasota area, and with her books across the U.S. and the globe.